Leading Manufacturer of tablet metal detector with de duster from Mumbai. Tablet Metal Detector with De Duster offeredcomes with advantage of longer dedusting path as well as meeting the demands of automatic tablet polishing from all sides. 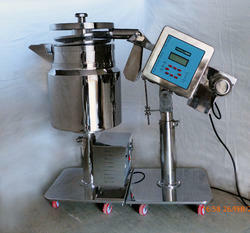 Allowing quality dedusting support without damaging the tablets, the equipment comes with new easy to handle features that provide for safe operations.Manufactured in conformance to CGMP standard, the system runs on electrical supply of 230 V AC single phase 50 Hz with provision of charging height adjustment and discharge height adjustment. Some of its features include allowing operator to remove dust and burrs from tablets, meeting FDA guidelines, variable throughput rates and others.